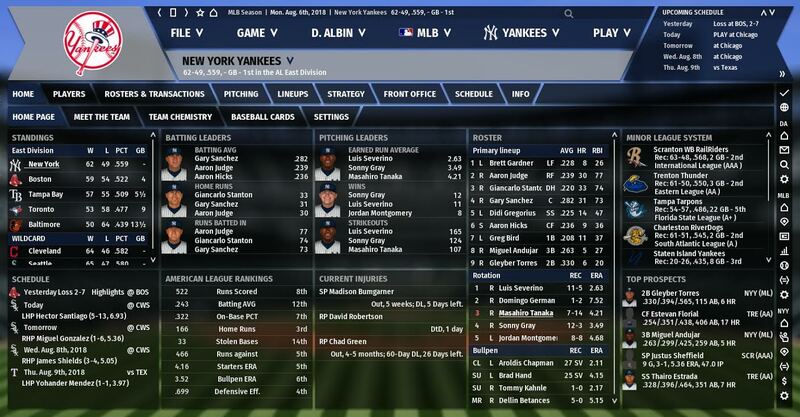 Acquired Madison Bumgarner for Jacoby Ellsbury (Yankees absorb 75 percent of remaining contract), Neil Walker, Clint Frazier, Albert Abreu, and Domingo Acevedo. Acquired David Freese (Pirates absorb all of the contract) for Chasen Shreve. Acquired Curtis Granderson for Cody Carroll and Carlos Vidal. Along with the acquisition of Brad Hand in last week’s edition, this was a flurry of activity that unquestionably improved the team. Bumgarner will pair with Luis Severino at the top of the rotation to make for a fearsome duo. Those two can run it back in 2019 too, as Bumgarner has a very affordable $12 million team option. David Freese is an insurance policy for Miguel Andujar, who hasn’t hit much (92 OPS+) and replaces Neil Walker on the roster. Curtis Granderson was brought aboard to take over for the departed Ellsbury. Though it was costly, Ellsbury is finally out the door. He’ll still be partially on the books for some time, but to shoehorn that into a deal for Bumgarner was a no-brainer. Dealing Frazier was a little painful but had to be done. Abreu and Acevedo are good prospects but certainly not dealbreakers. Dumping Walker was purely for salary relief. The others on the out – Shreve, Carroll, and Vidal – weren’t of much importance. Shreve no longer had much of a role with the addition of Hand. Carroll didn’t appear to have a place in this bullpen anytime soon. Vidal is a low-level prospect. The deadline was mostly a dud otherwise, with no big names dealt. The most significant trades happened in this post a couple weeks back. Now, on to the games. With the Bumgarner deal official on July 30th, the lefty was on schedule to start the 31st – and start he did. As hinted in the headline, though, things went sour. After two innings, he was forced to exit because of elbow soreness. After the game, elbow inflammation was revealed which is expected to sideline him for six weeks. Speaking of the game, it didn’t go well either, though that was the least of the team’s concerns. The bullpen was rocked, allowing eight runs in a 9-1 defeat. These kinds of losses happen, but this sort of injury is a big blow especially after just adding Bumgarner to the roster. Fortunately, the Yankees have a cushy division lead and he should be back for the playoffs. Domingo German was called up to take his place. Brush it off and salvage a series split, right? Wrong. Who knows what it is about the 2018 Orioles, but it seems like they have the Yankees number in this universe too. Masahiro Tanaka struggled through five frames, allowing three runs including a solo shot to Manny Machado who surprisingly stayed put at the deadline. Machado also went deep against David Robertson later in the game. As for the offense, well, there wasn’t much. The team mustered six hits against Alex Cobb and five Baltimore relievers, pushing just two runs across in the 6-2 loss. Oh, how things are different in this universe. Entering the series, the Yankees (61-46) sat six games ahead of the Red Sox (56-53). Pretty much the opposite of reality. Like real life, though, the first game went Boston’s way. It was shaping up to be a nice win for the Yankees, too. Gary Sanchez hit a three-run homer off Drew Pomeranz early, who was pulled with just one out in the fourth inning after allowing four runs. Sonny Gray couldn’t maintain that early 4-0 lead, though he nearly escaped up 4-2 through six. Instead, Brock Holt delivered a clutch two-run single to tie it and knock Gray out of the game. Meanwhile, Boston’s bullpen was lights out and didn’t allow another run. The Yankees’ relief corps caved when Jonathan Holder gave up two in the eighth, which was plenty of wiggle room for Craig Kimbrel to nail down the 6-4 Boston win. In the first three games of the week, the Yankees scored seven runs. They did not add to that total in game two of the four-game set in Boston, losing 3-0. Eduardo Rodriguez, Tyler Thornburg, Joe Kelly, and Craig Kimbrel spun a five-hit shutout, with all five hits being singles. Talk about a struggling offense. On the mound for the Yankees was Jordan Montgomery, who was mediocre in five innings of work. He surrendered three runs and took the loss. Finally, in game three, the bats came to life. Gleyber Torres stole the show with two home runs, and his batting line now stands at a remarkable .342/.407/.586. One of those two dingers was a grand slam in the fourth inning against Rick Porcello, which was part of a six-run rally. The Yankees tacked on one more in the ninth inning, which fortunately was enough because Luis Severino didn’t have his A game. Sevy allowed five runs in five and a third, though only three were earned. The bullpen held on for the 7-5 win. In what would have been Bumgarner’s second start in pinstripes, Domingo German began the game in his place. Things went about as bad as you’d expect, though it’s not like the Yanks had much of a chance with Chris Sale starting for Boston. German allowed six runs and Adam Warren surrendered one more, which was more than plenty for Sale. Boston won handily, 7-2, and took the series three games to one. Better than what happened in real life, but still, not good. Boston cut the division lead from six to four games with plenty of games left. It was a missed chance to bury the Red Sox, similar to what Boston just did to the Yankees in reality. The Yankees acquired Madison Bumgarner (! ), David Freese, and Curtis Granderson in the final 48 hours leading up to the deadline. They dumped Jacoby Ellsbury (! ), though retaining 75 percent of his contract, as part of the deal with San Francisco. Neil Walker also was sent packing to the city by the bay, along with Clint Frazier who was the headliner of the package. Prospects Albert Abreu and Domingo Acevedo were included too. To get Freese, the Yanks dealt Chasen Shreve; and to get Granderson, Cody Carroll and Carlos Vidal were traded. Oddly, there were no significant trades around the league in the first two days of the week as the deadline came and went. Game action for the week wasn’t pretty. Bumgarner made his first start against the Orioles but promptly left with elbow soreness. On a positive note, he’s expected to return in mid-September, so he should be good for the postseason if all goes well. Though the Bumgarner injury was certainly the worst news of the week, there were plenty of losses too. Baltimore swept the Yankees in a short two game set and the Red Sox snagged three of four from the Bombers at Fenway Park. Fortunately, even after the brutal 1-5 week, the Yankees still hold a four game edge over Boston for the division title.